They are heavier and nosier than electric mowers. They are often equipped with pull-start cords which are not as easy as pressing the start-button or turning the start key found on electric mowers. They require occasional engine maintenance, and you have to worry about gas, oil, spark plugs, and filters. They pollute the air with their gas emissions. Now, if you decide to get an electric lawn mower, the other point to consider is whether you will opt for a corded or cordless unit. The main problem with corded units is that they limit your mobility and can cause entanglement problems if the cord is not properly guided. ​For very large gardens and yards, it might make sense to get a gas or corded electric unit in spite of the problems listed above since you don't want to have to recharge the battery multiple times. But, for relatively smaller yards and gardens, it is certainly advisable to consider a cordless electric mower. One argument against cordless electric units is that they are not as powerful and can not run enough time on a full charge to complete the job. Note that the top cordless electric lawn mowers available nowadays and that will be compared in this article are equipped with motors powerful enough and batteries that last long enough to mow completely a relatively smaller yard or garden. 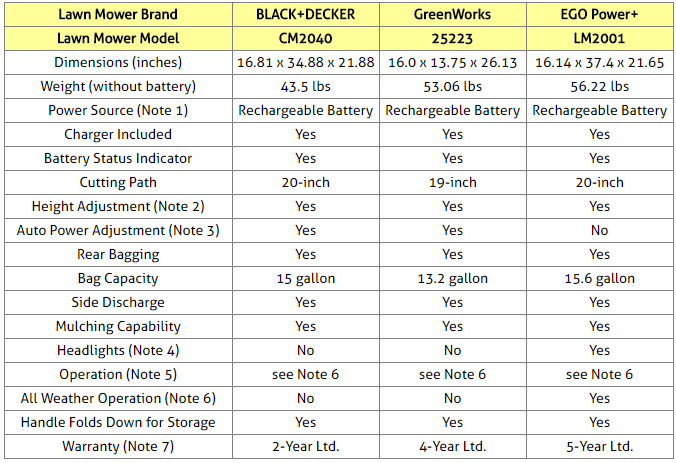 This article will compare BLACK+DECKER CM2040, GreenWorks 25223 and EGO Power+ LM2001 cordless electric lawn mowers. These were not just the most popular among Amazon customers at the time this article was written, but they had also received excellent reviews from most Amazon buyers (an average of at least 4.5 stars each out of 5 stars!). BLACK+DECKER CM2040 comes with two 2.5Ah - 40V Lithium-Ion batteries. Using both batteries run-times of up to 30 minutes can be achieved. When not in use, the extra battery can be stored in a convenient compartment on top of the mower. GreenWorks 25223 comes with one 4Ah and one 2Ah - 40V Lithium-Ion batteries. Automatic battery switch-over pulls power from the second battery once the first is depleted to eliminate downtime - for up to 60 minutes run-time. EGO Power+ LM2001 comes with one 4Ah - 56V Lithium-Ion battery which uses the industry-leading Arc-Lithium technology that delivers up to 45 minutes run-time and durability in all weather conditions. Note that this lawn mower is also offered with longer lasting 5.0Ah and 7.5Ah battery kits. BLACK+DECKER CM2040 is equipped with a 6-setting height adjustment lever that can be used to adjust the height of cut from 1.5"to 4" . GreenWorks 25223 is equipped with a 7-setting height adjustment lever that can be used to adjust the height of cut from 1.125" to 3.0". EGO Power+ LM2001 is equipped with a 5-setting height adjustment lever that can be used to adjust the height of cut from 1.2" to 3.5". 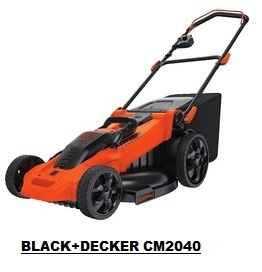 BLACK+DECKER CM2040 uses the BLACK+DECKER AutoSense technology to determine the thickness of grass and to make appropriate motor speed adjustments. For thicker grass, the mower kicks into high power, while in lighter grass, the mower lowers the power output to conserve battery life and extend run-time. GreenWorks 25223 uses the GreenWorks Innovative Smart Cut technology to adjust motor speed & run-time based on the thickness of your grass. Headlights make it possible to mow at anytime and see what you're doing. BLACK+DECKER CM2040 is equipped with a special on-off switch box. To operate the mower, all you need to do is push the button on the switch box, then pull the bail handle. To turn the mower off, you just release the bail handle. Once the bail handle has returned to the original position it will activate the automatic braking mechanism. 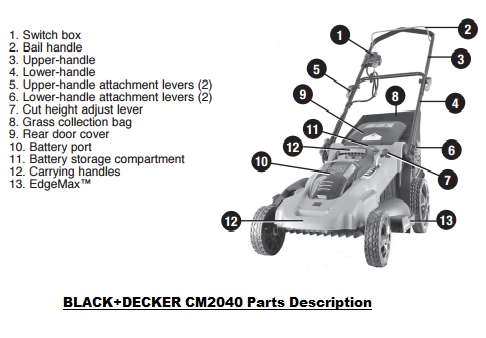 The motor is electrically braked and the mower blade will stop rotating in 3 seconds or less (please see BLACK+DECKER CM2040 parts description picture below for switch box and bail handle locations). ​To operate GreenWorks 25223, all you need to do is open the battery door and insert the key into the slot, press and hold the safety lock-out button, pull the bail switch upward to the handle to start the mower, and release the button. To stop the motor, just release the bail switch (please see GreenWorks 25223 parts description picture below for the bail switch location). EGO Power+ LM2001 comes with a safety key. To start the mower, you first need to insert the key into the key slot and then depress it. With the safety key depressed, you then pull the bail switch upward to the handle and release the safety key to start. To stop the mower, you just release the bail switch. Once the bail switch is released, it will activate the automatic braking mechanism. The motor has an electric brake; the mower blade will stop rotating in 3 seconds (please see EGO Power+ LM2001 parts description picture below for safety key and bail switch locations). EGO Power+ LM2001 product description states that the lawn mower delivers long-lasting power, rapid charging and durability in all weather conditions. Note however that even though some Amazon customers have said that there were no issues with using the unit when it rains or when it's wet outside, others have reported that wet grass may build up in the undercarriage which could eventually stall the machine. Note that the warranties listed above do not include the batteries which normally have shorter warranties. ​For exact price information of these three lawn mowers, please refer to the Amazon products section below. So which of the three cordless electric lawn mowers should you get? The three cordless electric lawn mowers considered here are excellent products as shown by the average rating each had received from Amazon customers at the time this article was written. Indeed, all three had received 4.5 stars (out of 5 stars)! Therefore, there is a good chance that you would be quite happy with any of these three products. EGO Power+ LM2001 is the only one equipped with headlights - important if you plan to mow after hours. BLACK+DECKER CM2040 and GreenWorks 25223 can both adjust the motor speed and power based on grass thickness, while EGO Power+ LM2001 can't. Note that if you wish to have an Ego Power+ lawn mower with variable speed motor, you should be considering the EGO Power+ LM2100 (see Amazon section below) which has a wider cutting path of 21-inch and also a self-propelled option. With the batteries that are included in the purchase GreenWorks 25223 provides the longest cutting time (about 60 minutes), followed by EGO Power+ LM2001 (about 45 minutes) and followed by BLACK+DECKER CM2040 (about 30 minutes). ​EGO Power+ LM2001 is the only one of the three lawn mowers considered here claiming that it can be operated in all weather conditions. Note however that even though some Amazon customers have said that there were no issues with using the unit when it rains or when it's wet outside, others have reported that wet grass may build up in the undercarriage which could eventually stall the machine. Finally note that, though various Amazon customers have said that all three lawn mowers cut the grass well up-to-the-edge of the yard, only BLACK+DECKER addresses up-to-the-edge-cutting with its specifically designed EdgeMax feature that allows you to cut grass right up to the edge of a wall or fence. Please click the lawn mower of your choice below for price information or to purchase. Note that when you click the EGO Power+ Amazon link image below, you will be offered not just the LM2001 which has a 4Ah battery, but also other configurations with stronger and longer lasting batteries. As mentioned above, EGO Power+ LM2001 does not support variable speed motor. If you wish to have an Ego Power+ lawn mower with variable speed motor, you might want to consider the EGO Power+ LM2100 which has a wider cutting path of 21-inch and provides also a self-propelled option. Note however that the battery pack for EGO Power+ LM2100 does not always come with the lawn mower and may need to be bought separately.